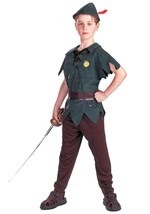 You can visit Neverland this Halloween in a girls Tinkerbell costume. 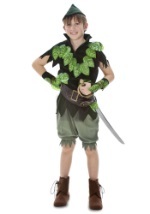 This Child Disney Tinkerbell Costume features a detailed cartoon print of Disney's Tinkerbell on the center of the bodice surrounded by glittering fairy dust. The bodice is trimmed with pink and white material in the center, around the neck, and around the tulle skirting. The capped sleeves are two layers of glittering tulle and the dress secures in the back with Velcro. 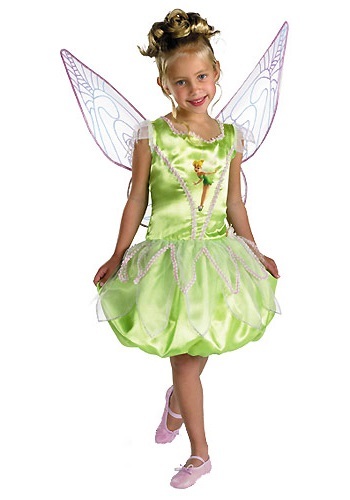 The balloon skirt makes this a trendy Tinkerbell costume. The wire frame wings are outlined with shiny pink material and stretched with sheer fabric that features a detailed glittering design. 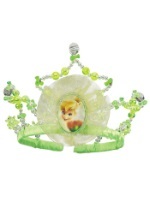 This costume will be complete with the additional Tinkerbell wand, crown, and shoe accessories. 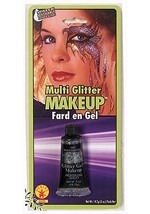 Fly high this Halloween in a Tinkerbell costume.